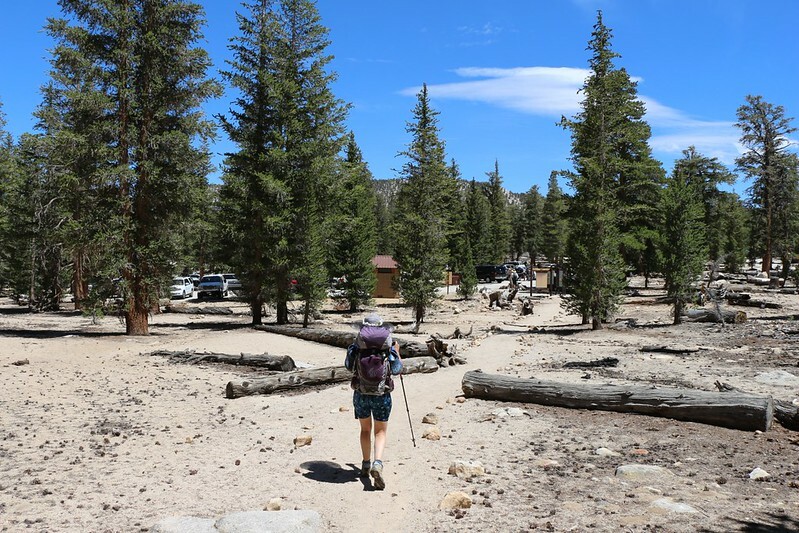 It sure was great to be back in the Sierra Nevada after two years of backpacking in what could arguably be called “lesser” locales, in terms of both elevation and beauty. But we didn’t originally plan on being there at all this summer, especially not for a measely three-day weekend. 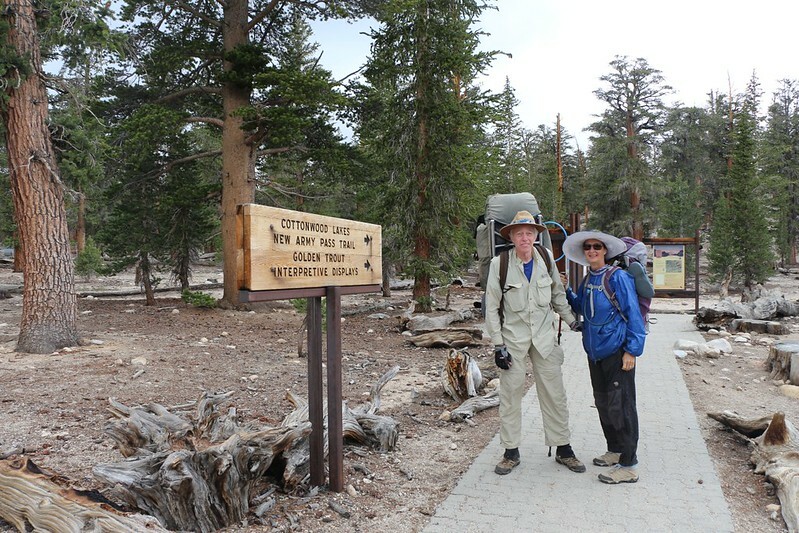 Vicki and I originally had a permit to hike in the San Gorgonio Wilderness, but then the Lake Fire ruined everything. So I had to scramble for something backpackable. Something fun! With available water, preferably. And that pretty much removed Southern California from the list of options. Which is sad, because we live in San Diego, about as far south as you can get. It’s a long way to the Sierra from there. 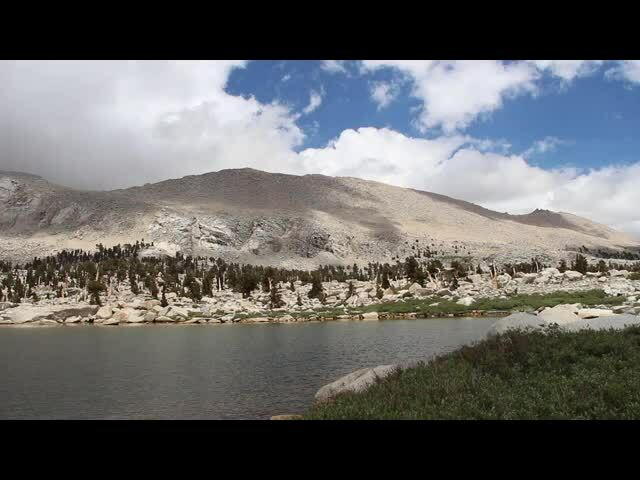 So I stared at the maps, read some trip reports on the internet, and came up with a plan to hike the Cottonwood Lakes, which is about as far south in the Sierra as I could find, while still being wet enough, and up high enough, to make it worth the long drive. 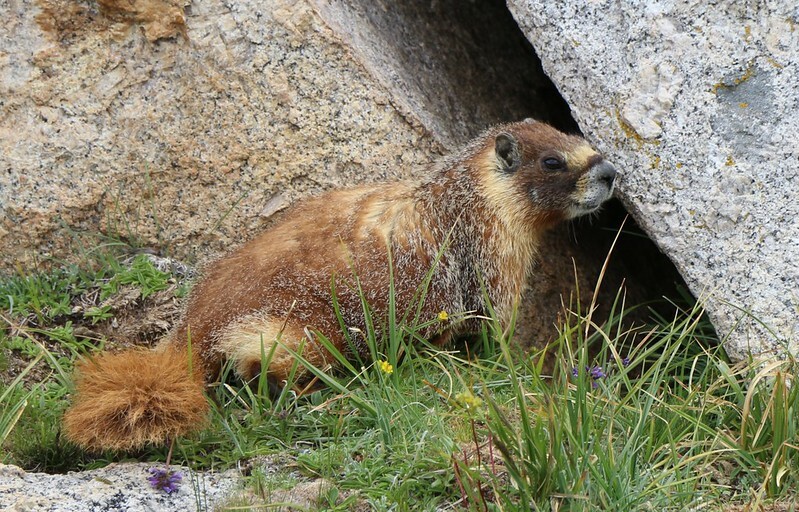 And if we were feeling particularly gung-ho once we got up there, we might even be able to bag a 14er! We woke up early, and left the house at 3:30am, which I figured would get us past the evil Friday-morning L.A. rush-hour traffic before six, when it starts getting ugly. We had breakfast at dawn in Victorville, and proceeded to enjoy the rest of the drive to Lone Pine. It’s a great feeling to be on vacation. We drove across the Big Empty, the Mojave Desert, on Highway 395 for what seemed like hours, seeing Joshua Trees and low mountains in the hazy distance. We were glad to have air conditioning this time. It’s hot out there in July. 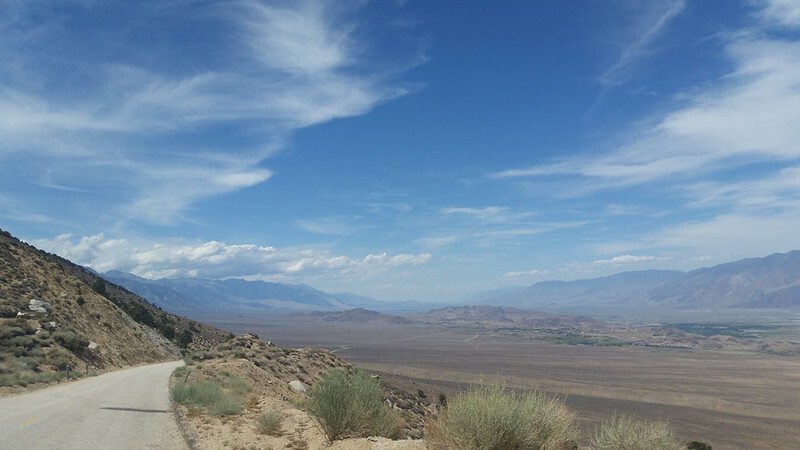 Eventually the road entered the Owens Valley, and the Sierra rose awesomely on our left, while the White Mountains rose on our right. We arrived at the Lone Pine Ranger Station. We were late for the 8am opening, so we had to hang around until the 11am lottery. It was a nice modern building, with museum-like displays. We bought some shirts and maps in the gift shop. Our luck was bad on the lottery but good on the choice of trail, as we got a permit to hike that very day. I was certain we’d be in the Horseshoe Meadows backpacker camp that night, but no. We drove up the road to the trailhead and got ready to hike. 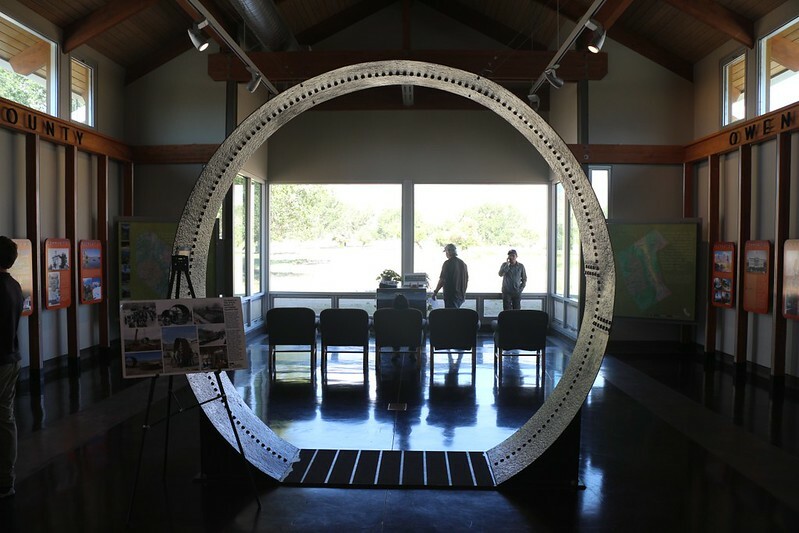 10 foot diameter section of the Los Angeles Aqueduct Pipe in the Lone Pine Ranger Station. 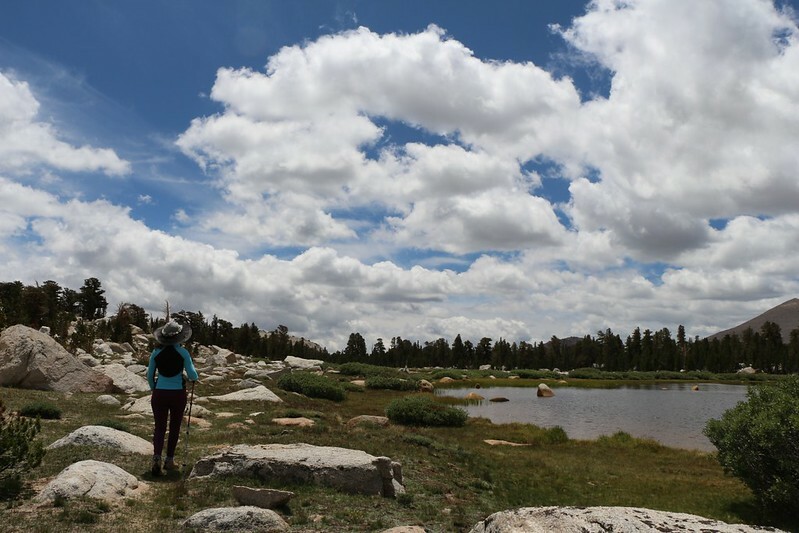 There were lots of big cumulus clouds over the Sierra Crest that day, and the forecast said “chance of showers,” but we decided to give it a try anyway. We had good raingear, and we knew what we were doing. We’d be fine. 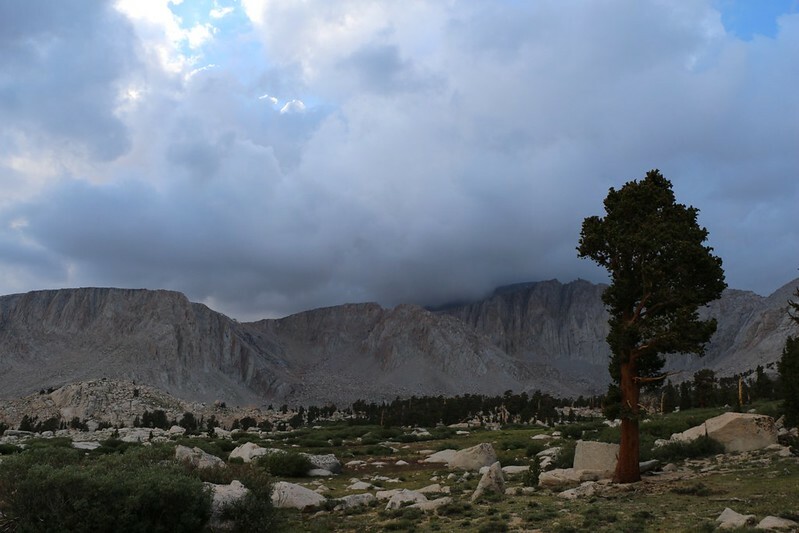 The air was cool up at 10,000 feet, but it beat the heat that was happening down in Lone Pine. Naturally, the moment we started hiking on the actual trail it began to rain. So we took off our packs, got out our raingear, and started all over again. 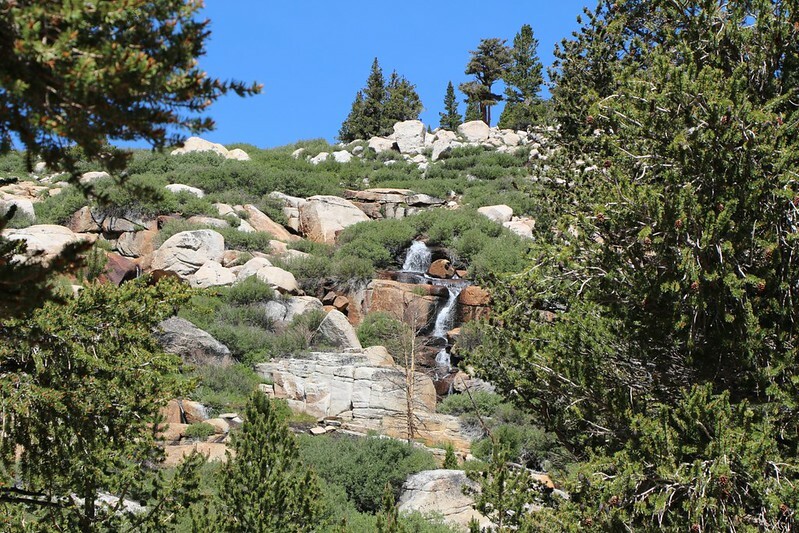 The first part of the Cottonwood Lakes Trail goes through the Golden Trout Wilderness. There were some nice meadows along Cottonwood Creek, and it was an easy hike through an open pine forest. Very Pretty. Golden Trout Wilderness Sign on the Cottonwood Lakes Trail. The rain was sporadic in the beginning, just enough to keep the trail dust to a minimum. But the closer we hiked toward the Sierra Crest the more it rained. 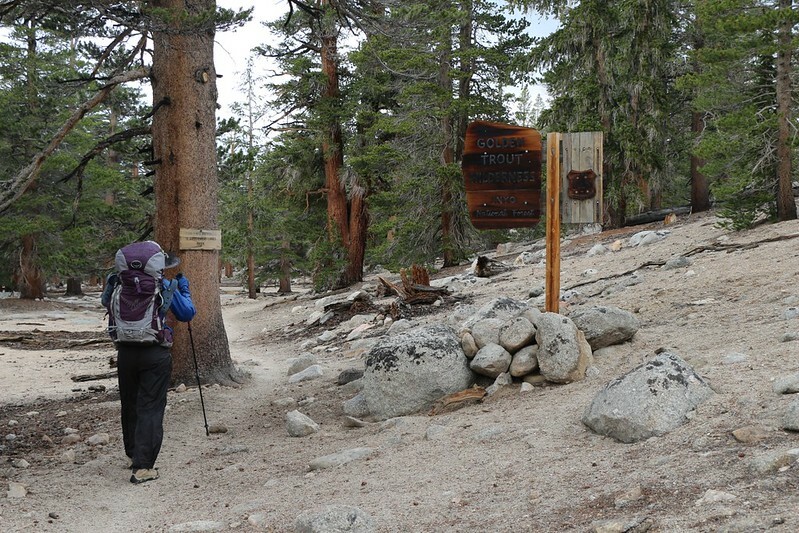 We met people coming down the trail who had summitted Mount Langely a few hours earlier. They said that it was snowing up there. 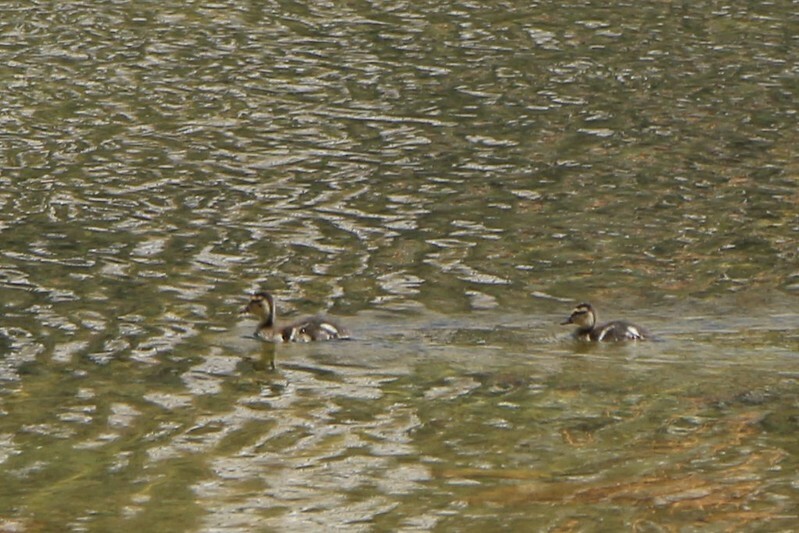 They looked happy to be nearing the parking area. We passed by a large meadow which was enclosed by a single, inch-wide woven plastic ribbon. We wondered what it was for. It certainly wouldn’t stop any wildlife. And then we realized that it was more of a semi-official notice to humans that the area was off-limits. Soon enough we saw why: This area was used by the “Golden Trout Camp” and there were several buildings and a bunch of large semi-permanent tents set up there. Interesting, but we didn’t visit. 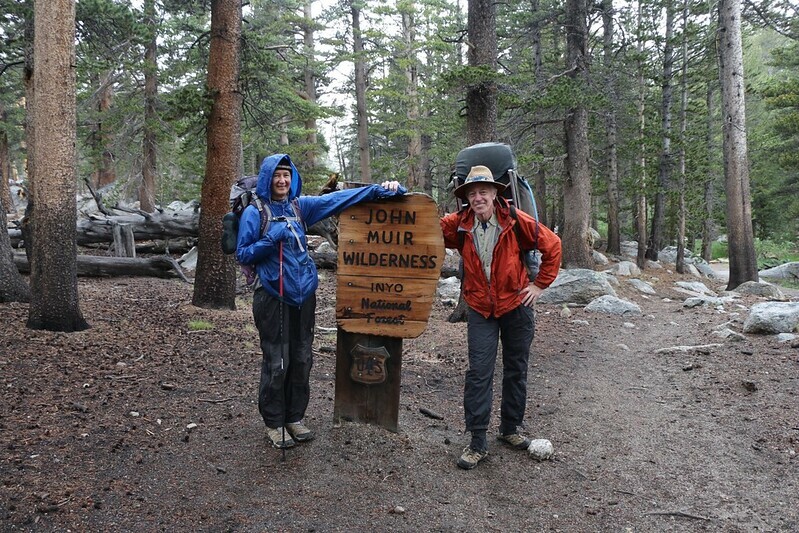 Meanwhile the rain began falling in earnest, as we entered the John Muir Wilderness. We posed by the official sign while a fellow hiker took our photo. Soon enough, however, it began to hail, as well. We heard some thunder booming. At this point it started to get really cold. And the rain came pouring down. The trail was awash in water. We walked on the edges of the puddles, hoping to keep our boots not quite so muddy and wet. It didn’t work. Raindrops on a puddle in the trail as we hike onward. 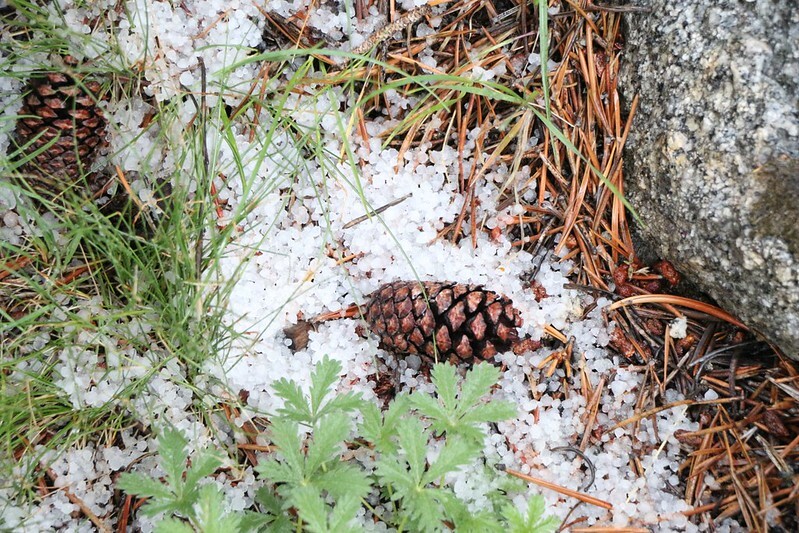 A pile of Hailstones amid pine needles and pine cones. It was cold, and we had to keep hiking to stay warm. But eventually it reached the point that Vicki was no longer generating enough heat. Her gloves were soaking wet and sucking the heat out of her. We made the decision to set up camp, right now, in order to avoid hypothermia. We got the tent set up in record time, so that the interior part of it barely got wet. 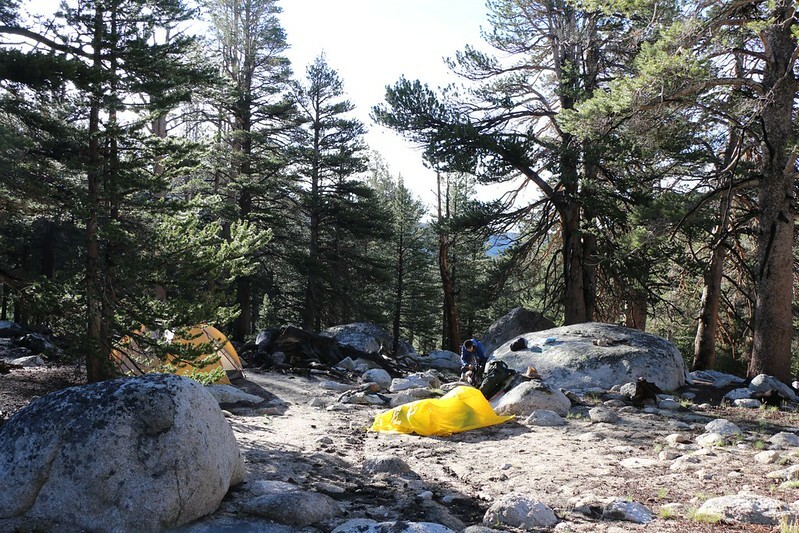 We opened our packs and tossed our clothes and sleeping bag inside, then ducked inside ourselves. It was immediately warmer in there, with no nasty biting breeze. 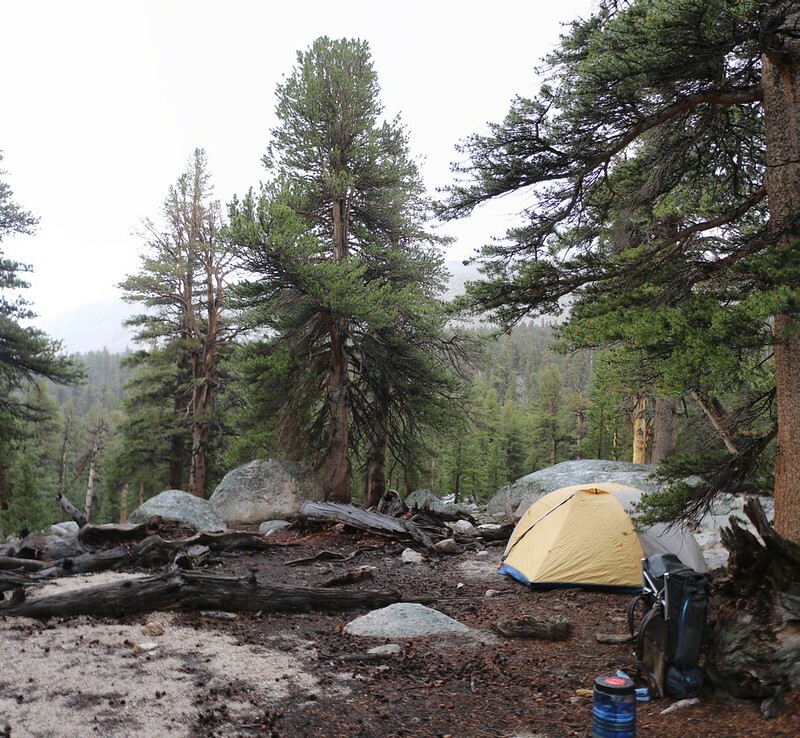 We listened to the rain pounding down on the tent and breathed a big sigh of relief. We were getting chilled after the hail and rain so we set up camp early to avoid hypothermia. Luckily, we hadn’t quite started hypothermia’s “uncontrollable shivering” stage. We got out of our wet clothes and put on the warm layers, then stuck our legs under the goose down sleeping bag. We then lay down and cuddled, trying to share our body heat. Too bad we were wearing all of those insulating layers, and my body heat wasn’t readily transferring from me to her. Vicki’s internal thermostat doesn’t always work correctly, and she wasn’t getting warmer. So I went out, filtered some water (we were camped not far from Hidden Lake’s small outlet stream) and got the stove going. I made some hot tea and a hot sealed pouch of Mountain House freeze-dried dinner. I handed both of them in through the door of the tent. Vicki stayed in the tent gaining heat while I wandered around outside sipping my hot chocolate. By this time the rain had stopped. The clouds were already breaking up and the sun was shining across the way. The hot liquids worked wonders. She came outside and we ate dinner together. I thought about packing up and hiking on, but only for a moment or two. That was when Reality reared its ugly head: We weren’t going anywhere after the long day we’d had. In fact, we ended up falling asleep before it got dark! The new day dawned clear and cold. All the residual raindrops on our tent were frozen solid. Inside the tent, we snuggled together, with only our faces showing from the hoods of our jackets. Brrr! We didn’t really want to get up, so we made excuses to stay in the sleeping bag. The sun eventually rose over the nearby mountain ridge and struck the tent. Hooray! That was our signal to get moving. Warmth had returned to the world. We got up and ate breakfast, watching as the frost melted all around us. Ahhh, ice in the morning! In July! 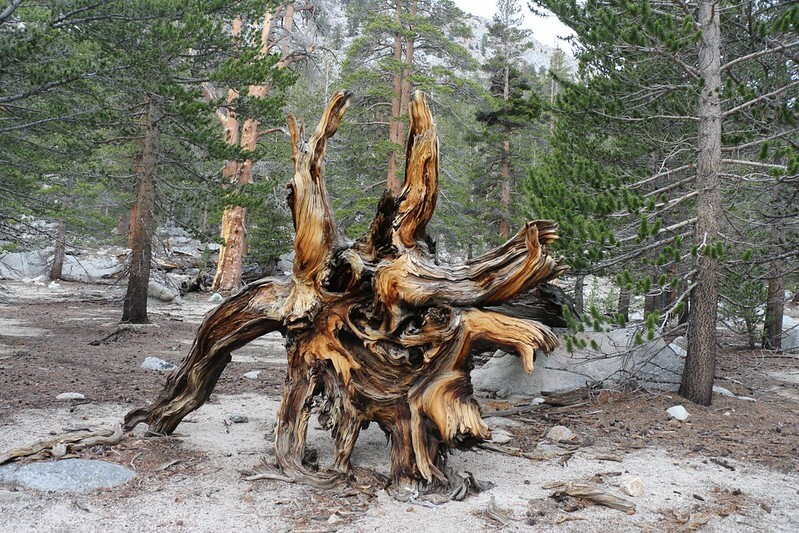 Only in the High Sierra. 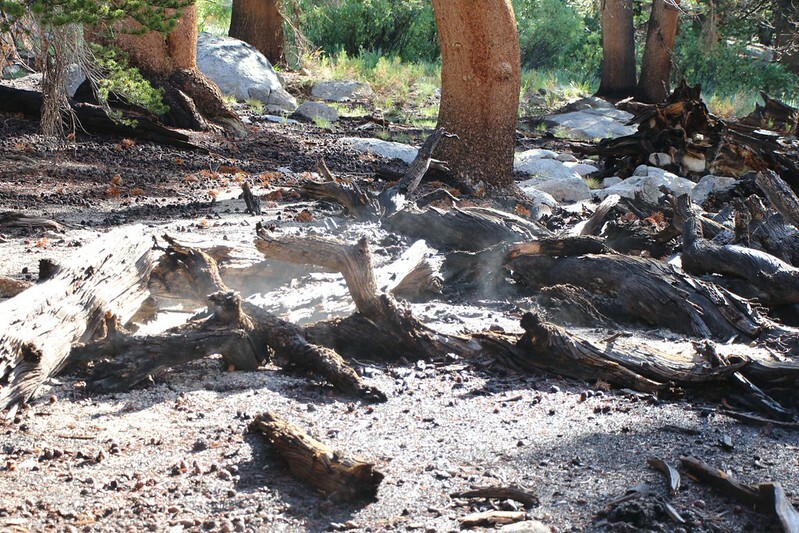 By the time we finished packing up the tent, nearby wet logs were steaming in the morning sunshine. We began hiking uphill toward the basin. We only had a mile or so to go, which was why I half-heartedly wanted to pack up everything after the rain stopped the night before. 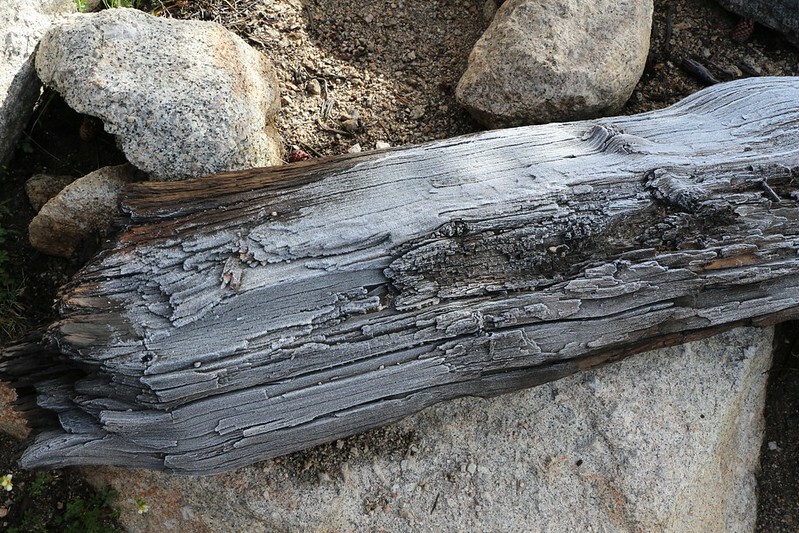 Morning hoarfrost on a log on the Cottonwood Lakes Trail. Once above the ridgeline, the views opened up all around us. We were in a wide, flat basin surrounded by mountains. I got out my smartphone and fired up the PeakFinder App that would tell me the names of each of them. Heh. Who needed an old fashioned map with cool technology like this available? We identified mighty Mount Langley (14,026 feet elevation) which was sporting a brand-new dusting of snow from yesterday! 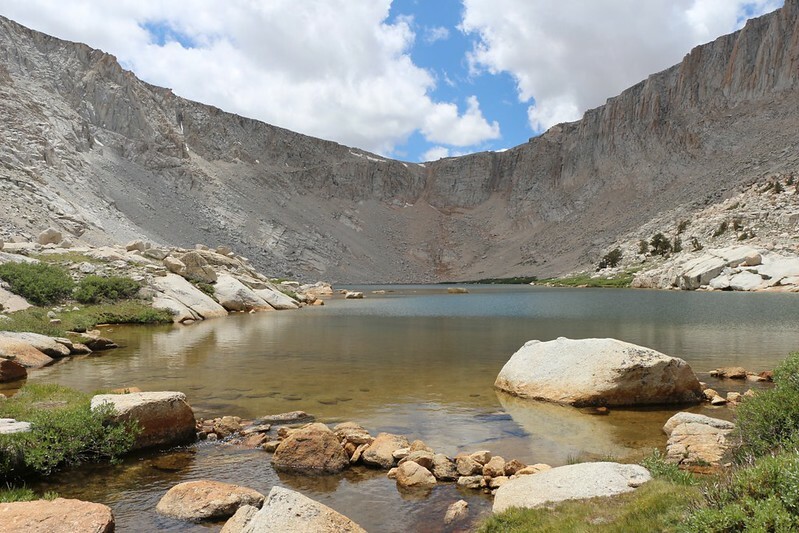 And around the corner was Cirque Peak; at 12,900 feet, it was an imposing hunk of granite all on its own. The other mountains in the ring had no names, only numbers (for their elevation). So I had to get the map out after all. Or I would have if the map didn’t happen to be pre-loaded onto my phone’s GPS app! Ah, yes! 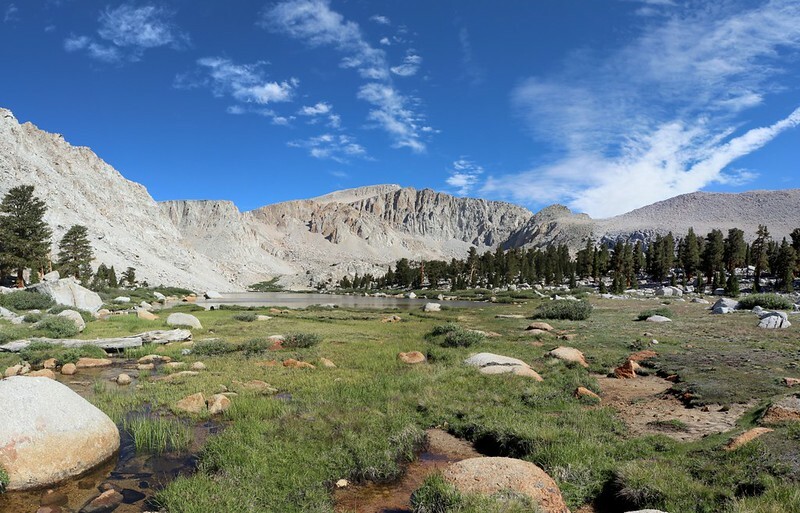 We reach the Cottonwood Lakes Basin at the Muir Lake Trail junction. 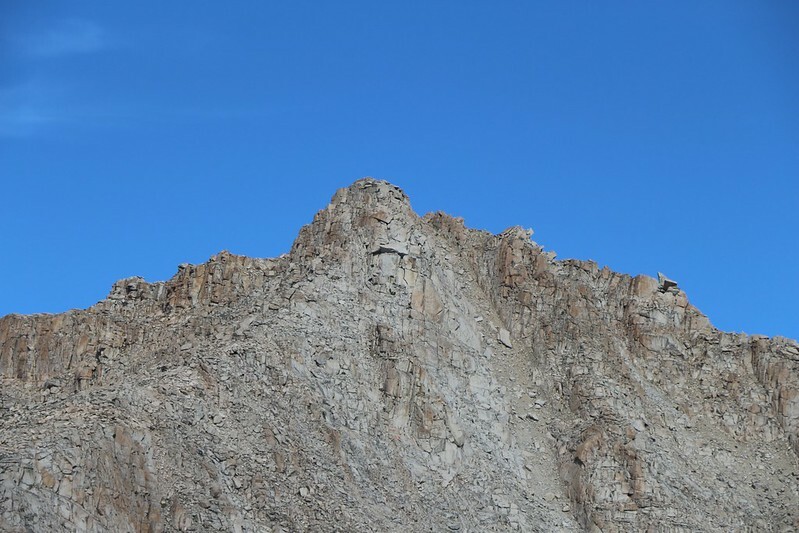 Zoomed-in view of Mount Langley and the headwall near Cottonwood Lake 5. There was a dusting of snow from yesterday! 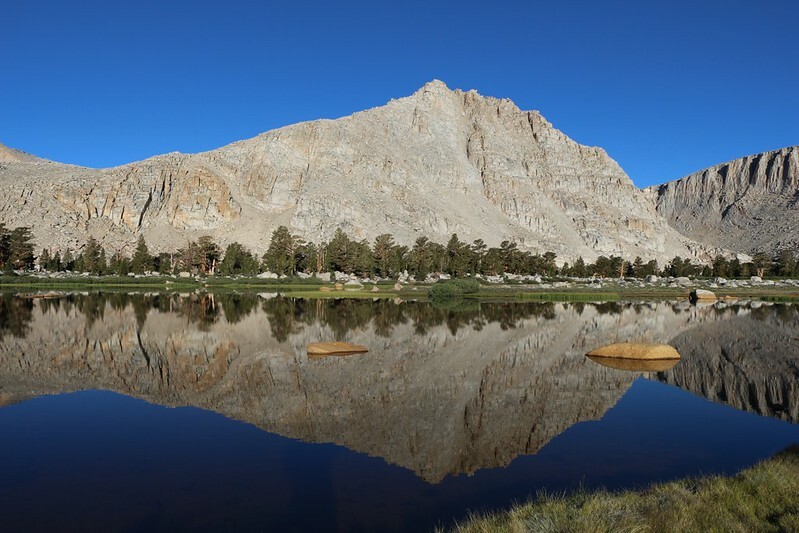 View of Peak 12369 and Mount Langley from across an unnamed lake in the Cottonwood Lakes Basin. We decided to set up camp right away, somewhere along the shore of one of the many lakes in the basin. 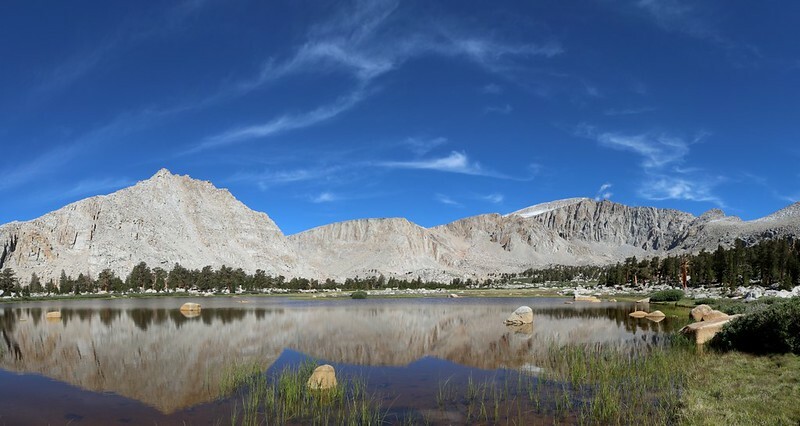 We chose an unnamed lake just southwest of Muir Lake. Dominating our view from here was Peak 12369 (also called Army Pass Point). Mount Langley was to our right, and Cirque Peak to the left. We examined the lake in front of us. It was MUCH smaller than the one shown on the map. The entire upper half of it was now a grassy meadow. Also, we could see from the stains on the rocks that the lake’s level was low this year. Our campsite at the edge of the pines near an unnamed Cottonwood Lake. Great views! It was still early morning, so we got a subset of gear ready for a day of easy hiking around the area. Just some lunch and snacks and the ten essentials. We wanted to see everything, even though we knew we didn’t have enough time. We day-hiked, cross-country, over to Muir Lake. Its water level was also low, and the outlet stream was dry. But there were some nice places to camp along the shore. We day-hiked, cross-country, over to Muir Lake. We headed back to the main Cottonwood Pass Trail, and followed it around the far shore of “our” unnamed lake. 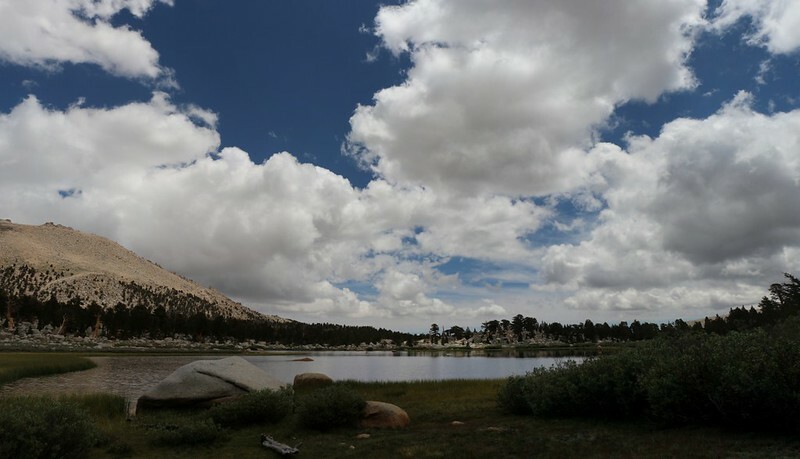 As we hiked, we noticed that the cumulus clouds were building up, although the weather report hadn’t mentioned rain. Still, mountains have a way of ignoring weather reports. We hiked faster. View over the large unnamed lake (across the way from our tent). 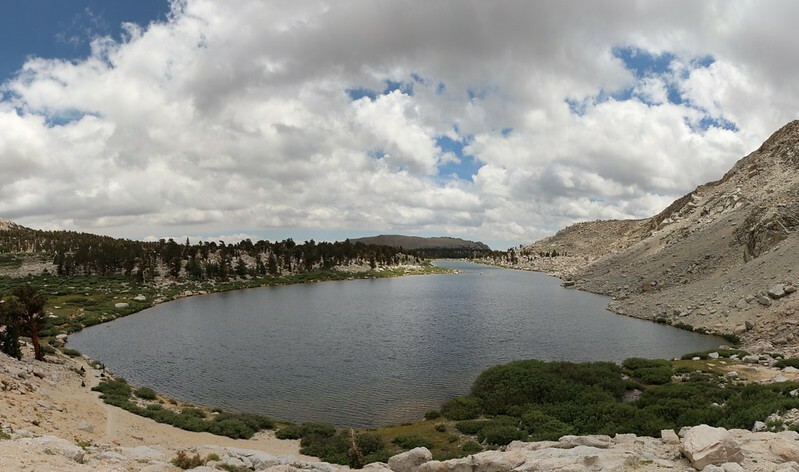 Eventually, we descended a short slope to the far northern shore of Cottonwood Lake number 3. Some folks we’d met the day before were already there, and were fishing. There was a breeze by this time, and the surface of the water was a bit choppy, which wasn’t making fly fishing very easy. In fact, they hadn’t caught anything yet, though one of them said he’d gotten a strike. Cottonwood Lake number 3 from the northern shore. Now, the numbering of these lakes changes depending upon which map version you consult. Tom Harrison calls this Lake 3. 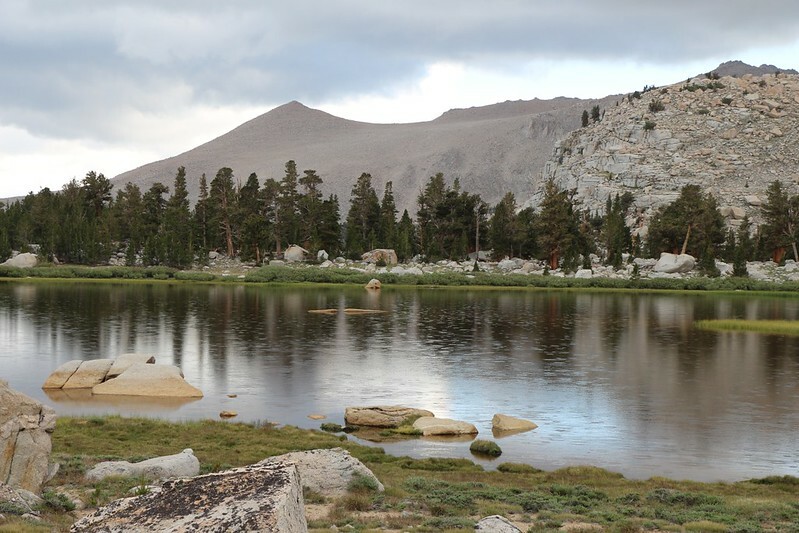 The US Forest and ArcGIS versions on CalTopo both call this Lake 4, but 2 and 3 aren’t shown. 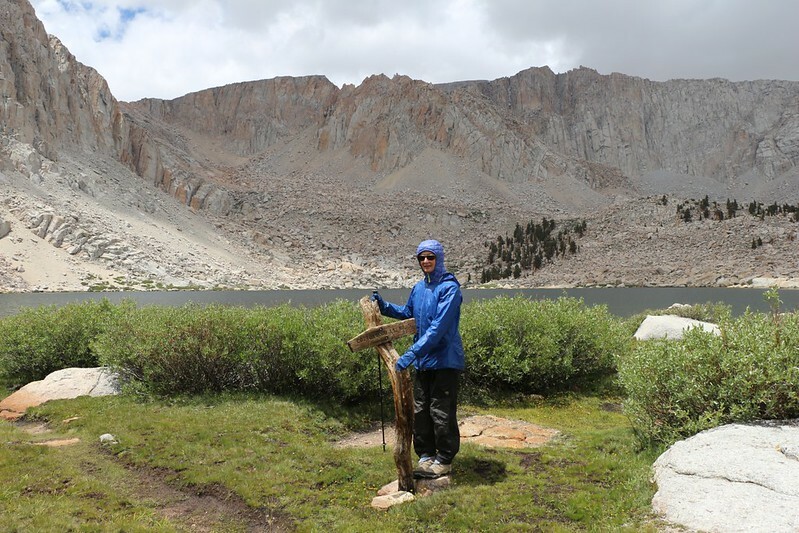 The older USGS version on Caltopo only names Lake 5. I’m going to stick with the Tom Harrison Map because at least the numbering follows the flow of the water, which makes sense. So Lake number three it is. 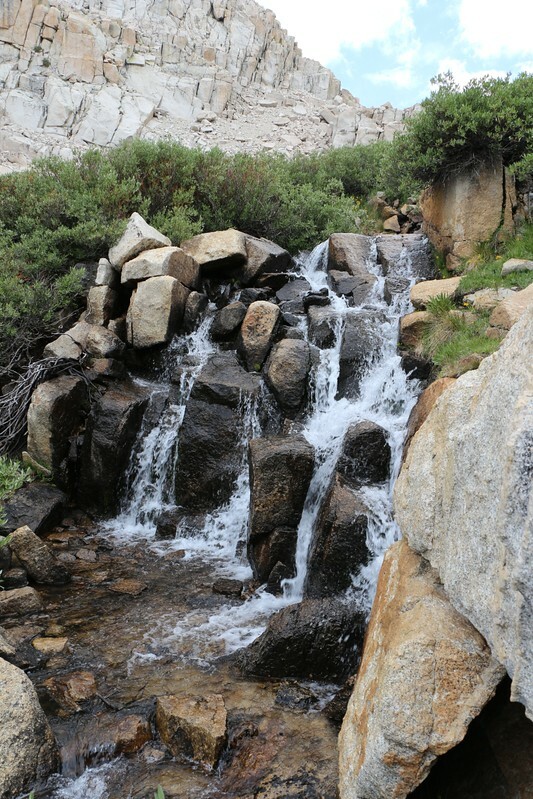 We climbed past a small waterfall up to the upper basin, where we saw Old Army Pass and Cottonwood Lake number 4. (Old) Army Pass was no longer a maintained route, as it travels on a steep north slope and often had snow on it all year round. 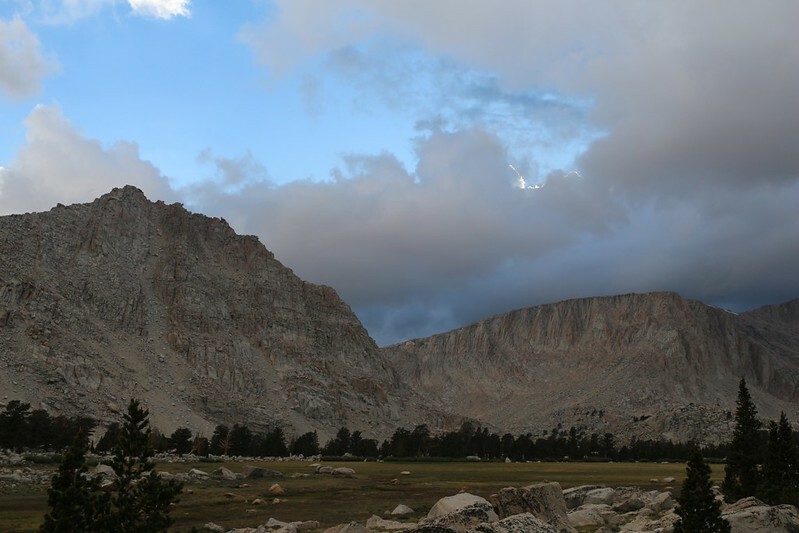 There was now a “New Army Pass” a couple of miles away that is the main route over the Sierra Crest. Still, lots of people continue to use Army Pass, as it is the shortest way to the summit of Mount Langley. Cottonwood Lake number 5 was the most upstream lake of the named lakes. There were a number of people camping around it, as it is also famous for its trout fishing. The wind was blowing quite strong up there, and the clouds were getting darker, so we didn’t stay long. We wanted to get back to the tent before any rain fell. Raindrops on the lake from our campsite. We thought of those we’d met earlier that afternoon, heading up to Langley’s summit. They were probably up in that ice cold cloud. One madman was wearing short pants! We shivered for them, and wished them well. As usual, the clouds broke up before sunset, and the sky was clear by nightfall. A storm descends on Mount Langley. We woke up to another beautiful day. But it had been cold and crisp overnight, with no moon and the Milky Way shining clear. The condensate from our breath on the inside of the tent was frozen solid. We carefully lifted off the tarp layer, then walked away with it and shook it vigorously. All the ice fell off and we were left with a dry tent! Nice! Reflection of Peak 12369 (Army Pass Point) from our campsite the next morning. After that, it was time to hike out, heading cross-country to see some of the other lakes on our way back to civilization. This time we visited the southern tip of Cottonwood Lake number 3, which also had a very pretty outflow pond at its southeast end. 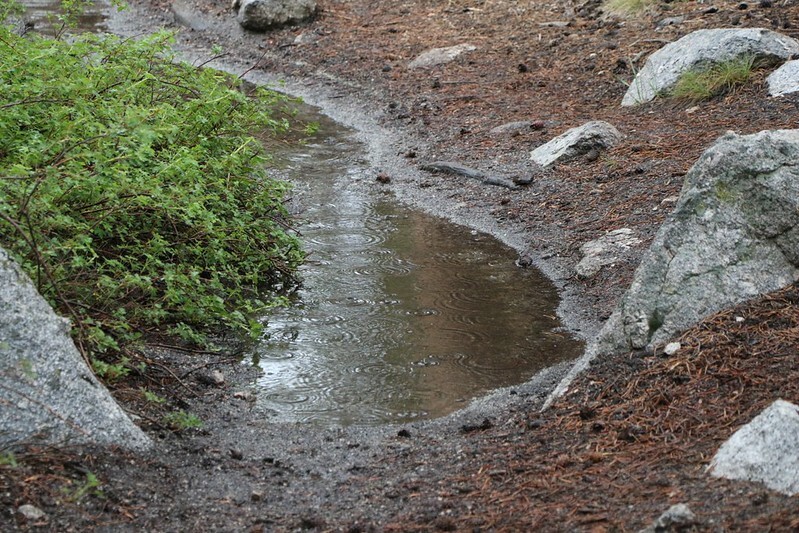 Small outflow pond southeast of Cottonwood Lake Number 3. There were plenty of cirrus clouds in the sky, and they made for some excellent pictures. I was snapping photos in every direction, having a great old time. Now THIS was what mountains were SUPPOSED to look like! Absolutely beautiful. 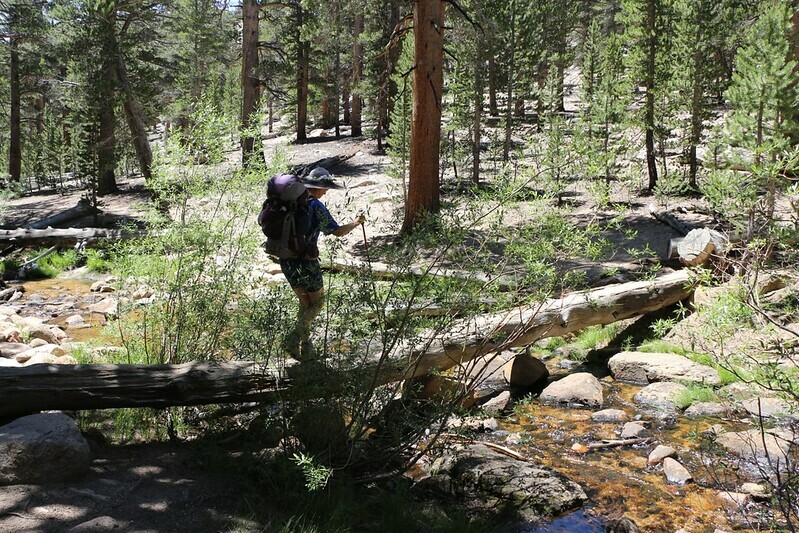 We walked along an old trail that crossed the meadow between lakes one and two, and got many views of both lakes. Eventually we joined with the main trail that heads for New Army Pass, but we turned left and headed back toward civilization. We didn’t really want to rejoin the busy world out there, but we knew we had to. Meanwhile there were more lakes and mountains to see. We walked along the shore of Lake number one and watched the fishermen flycasting alongshore. They had tents nearby, out in the open and exposed to the hot sun. 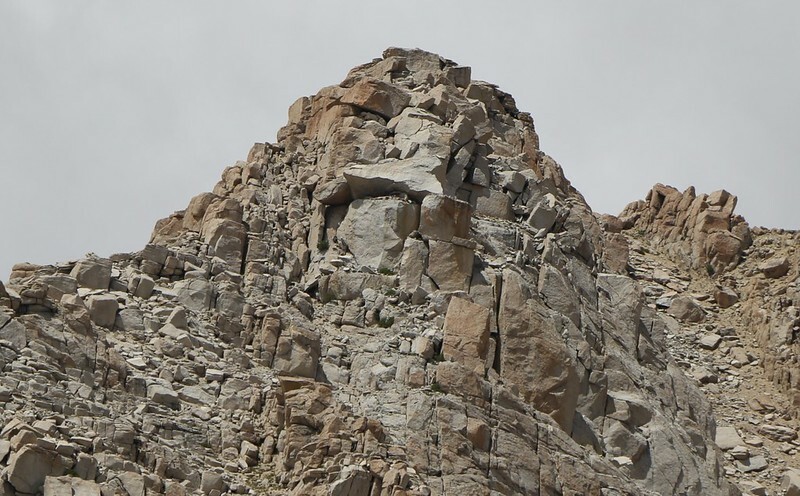 Then we took one last look around the basin at Mount Langley, and Cirque Peak, and good old Peak 12369, which had rocks near its summit that looked like an old man’s face. Then we began our descent into the Cottonwood Creek Valley. Along the way we heard what promised to be a waterfall, so we took off our big packs and walked over to check it out. 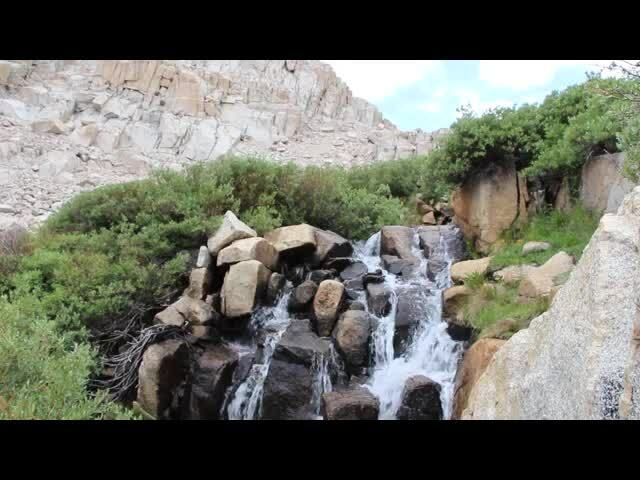 It was running slow in this drought year, but we could see the staining on the rocks that told of how awesome it must look in the spring during the snowmelt season. After that it was simply a hike down a long forested valley. There were plenty of trees and plenty of lovely meadows. The trail seemed longer than it had the day we arrived, probably because it was hot and sunny out. In fact, both of us ran out of water, but we didn’t bother to stop and filter any from the creek because we had less than a mile to go. We arrived back at the Horseshoe Meadows Parking Area and took off our shoes and socks. We had another set for use in the car, which made our feet happy. We stowed the stinky damp socks and shoes in the trunk, which made our noses happy. We arrive back at the Horseshoe Meadows Parking Area. Then it was time to drive back home. There were lots of nice views both north and south as we descended on Horseshoe Meadows Road. Vicki marvelled at the drop-offs next to the road, which only rarely bothered with a guard rail. Not a place to let your attention wander! 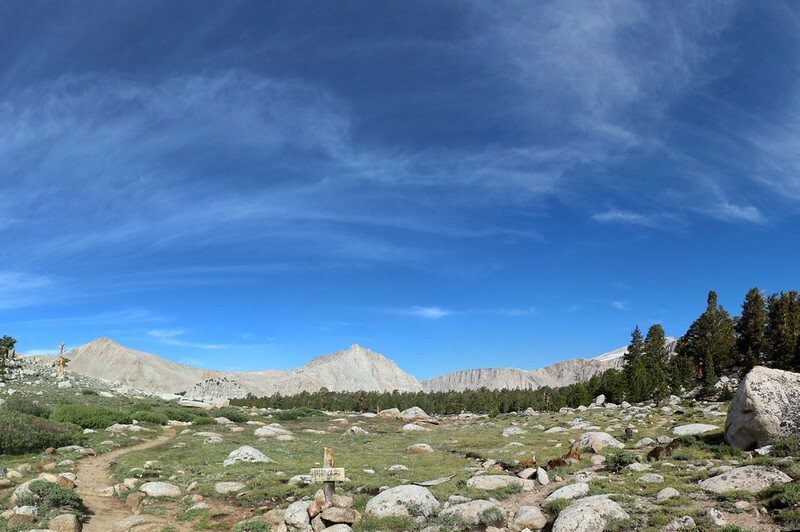 Another nice view north as we descend on Horseshoe Meadows Road, with Lone Pine on the right. We drove to Lone Pine and had some burgers at the local Carl’s Junior. We dumped lots of salt on everything, and it tasted great. We really needed it. Then we braced ourselves for the big drive home to San Diego. It had been a great trip and well worth the long drive. It was even worth the close encounter with hypothermia! In fact, I’m hoping to be back up here to bag Langley later on this season. Caltopo Map of our hike.